August 29 was a typically cool, wet summer day in downtown Seattle. “We support you!” cried the crowd of 30 or so gathered outside Specialty’s Café, their voices reverberating off the glass facades of adjacent downtown buildings. To remain open, the restaurant had been forced to call in extra staff. Six of its workers had joined the national fast-food workers’ strike that day to demand $15 per hour and a union. The crowd in front of Specialty’s was distinctly of the type able to attend an anti-corporate demonstration in the middle of a workday — young and mostly white, trying to act as allies. Their chants were not those of workers with a grievance so much as those of outsiders seeking to connect with Speciality’s labor force inside. As they spread across the United States, “Fight for 15” actions like this one have spurred a debate over what constitutes a living wage, casting a spotlight on working families in an economy where the odds are increasingly stacked against them. 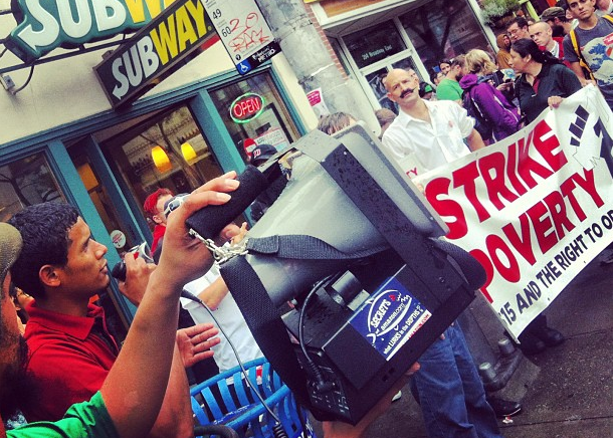 Beginning with fast-food restaurant strikes in New York City last November, the campaign has gone national in large part due to the backing of the Service Employees International Union. The effort has been a public-relations success for SEIU and for the labor movement generally, which otherwise appears to be in decline. However, a gap has emerged between the institutional organizers and the low-wage workforce they are seeking to organize. Further highlighting the absence of bottom-up organizing in this campaign has been SEIU’s tight control over media surrounding the protests. During a day of strikes in New York City on April 4, an interview Waging Nonviolence conducted with a young Wendy’s employee in Brooklyn was cut short when an SEIU staffer intervened. Reporters, along with a striker who had just decided to join the protest that morning, were informed that only participants with authorization were allowed to speak to the press. Reporters who wanted to talk with a worker were told to attend another rally later that day, when designated spokespeople would be present. Activists who had come out to support the strike in New York reported similar instances of conversations with workers interrupted by union staffers who wanted to make sure the activists were not representatives of the media. From the get-go, SEIU organizers have been highly conscious of the campaign’s public image. They’ve retained Purpose to provide the branding that has been the public face of the campaign. The company’s CEO, Jeremy Heimans (who did not respond to requests for comment), has described Purpose’s model as one of “movement entrepreneurship.” Purpose was crafting the campaign’s messaging well before the first walkouts occurred last November. While the demand for $15 per hour and a union has resonated with a growing minority of fast-food employees, efforts by workers to become movement entrepreneurs themselves have hit stumbling blocks. At a national conference involving fast-food workers and campaigners in Detroit last month, blogger and labor activist Adam Weaver reported that participants arrived to discover that plans for the August 29 strike had already been devised by SEIU in advance. The conference, he reported, was little more than a “pep rally.” One worker told Weaver that participants began to speculate that “maybe this isn’t our movement” but SEIU’s. The Fight for 15 strikes are part of a broader shift within the labor movement, an effort to regain relevance with innovative, media savvy strategies that highlight the worst abuses of the labor market. And there are plenty to choose from; paralleling the decline of unions in recent decades, earnings for U.S. workers have gradually declined as well. With the federal minimum wage worth $2 less than it was in 1968, and nearly one third what it would be had it kept pace with productivity, low-wage workers have been the hardest hit by the decline of organized labor as a whole. SEIU is not the only union grasping for new strategies. The AFL-CIO, for instance, is seeking to add millions of non-union members to its books and to allow worker centers, which frequently organize immigrants in low-wage professions, into the the federation. Meanwhile, the United Food and Commercial Workers International Union is backing the Our Walmart campaign to improve pay and conditions at the mega-retailer. Adam Weaver describes the SEIU-organized strikes as “militant lobbying” and a “march on the media”; he surmises that the union is likely seeking either an overall industry-standards agreement with the fast-food industry or to leverage the highly visible campaign for legislative measures to raise minimum wage levels. Both scenarios would fall short of the $15 an hour and a union the campaign demands, but they would be victories that could be seized upon to help strengthen future struggles. In any case, the direction of the campaign seems to be largely out the control of the striking workers themselves. In Chicago, where a teachers’ strike last autumn helped permeate a sense of class consciousness in the city, the fast-food campaign has taken a more organic turn. “We have explicit conversations about our vision of what it means to be in a union,” said Trish Kahle, who is part of SEIU’s campaign in Chicago. There, it has encompassed low-wage workplaces beyond just fast-food restaurants. Employees of Nike, Victoria’s Secret and Whole Foods — where Kahle herself works — have joined in. Some insist that for organized labor to make a true comeback, it will have to rebuild itself from below. Commenting on the AFL-CIO’s convention in Los Angeles earlier this month, labor historian Steve Early expressed skepticism at the zeal with which organized labor is incorporating the low-wage workers it has traditionally excluded. He argued that incorporating them into the federation has less to do with building union power in workplaces than it does with building lobbying power within the Democratic Party. Early noted a suspicious lack of “strategies for defending and re-energizing labor’s existing members” at the convention. Like a mythical sorcerer’s apprentice who conjures a force she cannot control, SEIU may be spawning a force that will rise above its managerial powers by encouraging workers to take direct action at their workplaces. As they gain a taste for their own power, employees in the fast-food industry might realize that not only are the restaurants they labor in theirs to master, but their unions are as well. Joshua Stephens contributed reporting to this article. This is a really useful contribution to the debates about Ff15, and about the labor movement more generally. One thing I think is really important – and is worth drawing out more explicitly in further writings – is how and why things were different in Chicago than elsewhere. Having the working model of the CTU strike, for people to see in action (and in victory), is a really important practical lesson people just don’t have in most other places. I like this article and the observations here. I do hope though that the $15 is more symbolic than literal and this is why. The cost of living expenses in each part of the country does not demand an across the board $15 per hour job. In addition, the weakness of the top-down unions of the past is that by negotiating for wages with an interest in one party only. Such deepened the divide between owners and employees. By example, both were seeking to get the most out of the other with as little payback as possible. Such is not a positive work environment neither does it lend itself to any kind of democratic reform. It resembles the 99% vs the 1% where each scapegoats the other and that prevents the joining of the two in working for a full democracy. You know, my opinion is that bosses ALWAYS want to get the most sweat out of their employees for the least money they sustainably can. that’s how you maximize profit. If you don’t your competitors pass you by. thus workers HAVE to fight their employers unless they like accepting stagnating or deteriorating pay. Sure you don’t need $15 an hour to live. just to live with a bit of dignity and money to eat out, take a vacation once in a while, or but health insurance! It occurs to me that it would be EXTREMELY undemocratic to run a campaign called “fight for 15” and not actually intend to fight for 15! How can you support lying to workers who risk their jobs and then call for democracy–which according to you is mutual respect between the wealthy 1% and the majority? Why is it democracy for the vast majority to limit its actions, hopes, and possibilities to what is acceptable to the 1% minority? Why is it justice for those who live by employing and exploiting the labor of others to use the wealth generated by workers to rule over them? What we need to do is come together across our differences, no matter what they are. A little help from above would be great, so I’ve published this petition that was tried last year once again. The timing is much better this time around. Everyone wants to even the score against the right wing 1% anti-union crowd. Please sign and share widely. This involves ALL of us.